You know the drill: you open your Whirlpool-Kitchenaid-Kenmore dishwasher after it supposedly ran through the cycle last night and… the dishes still have last night’s grits and redeye gravy sauce smeared all over them. Or maybe the clean light is blinking seven times. So you do some very intelligent button pushing on the control panel and, using your keen Vulcan-like powers of observation, discern that water does indeed flow into the dishwasher. And it gets pumped out after a while, too. OK, no problem with the water. But when it’s supposed to be washing, you hear a loud, low hum or growling noise instead of that old familiar quiet, almost inaudible sound of water swishing around. Most likely what’s going on is that the wash motor in the dishwasher is what we professional appliantologists call FUBAR. Wellllll, you just grab ‘hold of those two mushy lumps at the base of your spine and let’s do the Samurai Fixit Romp! Y’see, Hoss, this dishwasher is a lot different from the good ol’ dishwashers with the single big honkin’ center-mounted motor that sandblasted all your dishes clean and pumped the water out. As effective and reliable as that design was– still lots of ’em in still in service out there today– it was deemed politically incorrect by the Masters of the Universe. So, Whirlpool dutifully developed the new Energy Star-compliant design, dubbed the Point Voyager dishwasher. It uses a much smaller wash motor and an even smaller drain pump. Good idea in theory and it sure does run a helluva lot quieter that the old war horses. But their weak point seems to be the bearing seal in the wash motor. After a while, the bearing seal leaks and water gets in there, seizing up the wash motor. You could replace just the wash motor but, in my vast and awesome experience, it’s worth the few extra shekels to replace the entire motor pump assembly. That way, you’re getting a whole new impeller, macerator, and pump volutes, which can trap all kinda ca-ca. 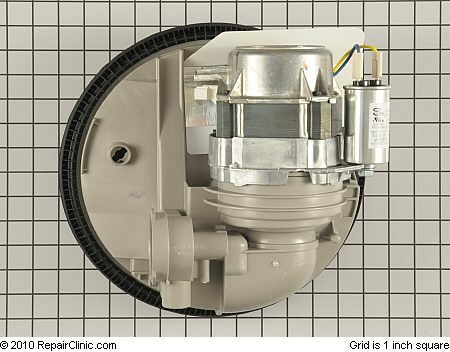 And replacing the motor-pump assembly is easier than replacing just the wash motor since you have to remove the motor-pump assembly in either case. It’s just plug n’ chug; easy job, about two mugs on the world-famous SUDS-o-meter. … or, for my grasshoppers who prefer a more cinematic experience, you may wish to watch the Samurai in action as he replaces the entire motor-pump assembly in less than four minutes, a world-record! The only thing I didn’t show in the video was the pull tabs that hold the motor-pump assembly in place. That’s ‘cuz I’s moving so fast that it woulda just been a blur anyway. But here’s a still shot that shows what they look like and explains a bit about ’em. Click the pic for the larger view. 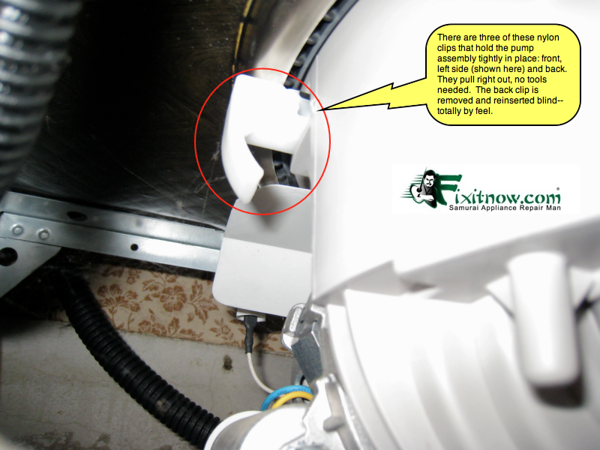 This entry was posted in Dishwasher Repair on May 21, 2010 by Samurai Appliance Repair Man.